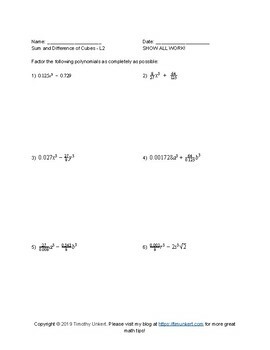 In this 5 worksheet pack (Levels 1 - 3, 1 quiz, 1 bonus worksheet) students will factor sums and differences of cubes, they will solve for cube roots and find all roots of polynomial equations by factoring the sum and difference of cubes then solving for the roots from the factors. They will go up levels 1 - 3 before taking a quiz. In level 1 students deal with whole number problems before progressing to decimals, fractions, and square roots in levels 2 and 3. In the quiz they will test their knowledge. 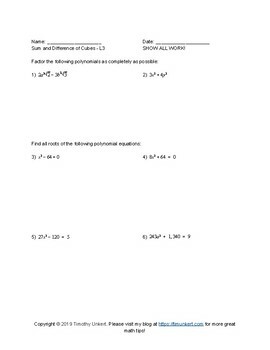 In the bonus worksheet students will find the roots of polynomial equations and write their solutions in polar form. 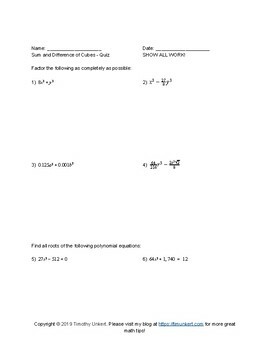 This has great but difficult problems for students in Precalculus or Honors Algebra II.